That's because there is residual inventory — homes that didn't sell in October and November, sometimes because they were over-priced, said Tarik Gidamy, co-founder and broker of record with TheRedPin. "(Sellers) who are desperate — who have bought a house already and need to sell what they've got — are willing to take a cheaper price simply because the supply of buyers is not 100 per cent there yet," he said. Based on the seven-year averages, TheRedPin found that Toronto-area homes in January sold for nearly $70,000 less, compared to the spring housing market, which peaks in May. May is the month that also showed the highest home prices in the analysis, a seven-year average of $568,255. TheRedPin also found that buyers paid an average 1 per cent (or $7,000) below asking price in January over the course of the study period. "On average, home prices between January and February increased by $34,455 — the largest month-to-month increase of the year," according to TheRedPin. The second least expensive month to buy is August, when the average home price over the last seven years was $529,169. The long-term average is considerably lower than the average cost of a home in Toronto last year, when prices jumped 20 per cent to $730,472, according to the Toronto Real Estate Board (TREB). Homes sold in January also tended to be on the market longer, listed for 33 days compared to an annual average of 26 days. Just as the third Monday of January is known as Blue Monday because it's cold, Christmas cheer has faded into the reality of holiday spending hits home, home buyers are often "not exactly back on the horse of spending money," said Gidamy. 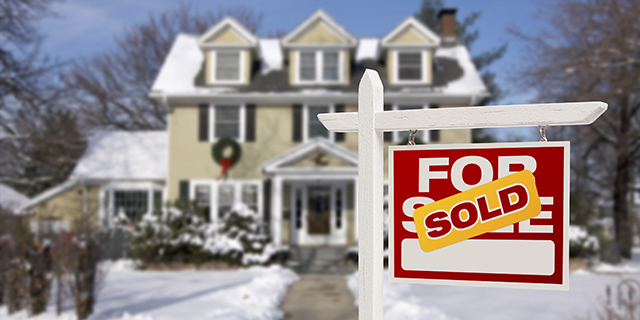 But if buyers' mortgage approval and financing is in order, January can be a great time to hunt for a home. "It's just a process of getting yourself organized to buy something," he said. As the month wears on, however, it increasingly makes sense for those listing their homes to consider waiting for spring. "If you're going to appeal to the masses — it's not a niche (property), an $8 million or the opposite — if you're in that sweet spot, waiting until spring is ideal," said Gidamy. There were 9,505 new listings on the market on average over the past seven years in January — about half as many as in May. While the seasonal trends tend to hold, according to Gidamy, the inventory of homes in the Toronto region has been trending down, the Canadian Real Estate Association (CREA) said on Monday. Nationally, the supply of homes on the market dropped to 4.6 months in December, down from 4.8 months in November. But in many Toronto region markets, the inventory ranged between one and two months. In some areas, including Durham Region, Oakville-Milton and Orangeville, there was less than one month of supply, said CREA. "The tight balance between housing supply and demand in Ontario's Greater Golden Horseshow region is without precedent," said a statement by CREA's chief economist Gregory Klump. Nationally, home sales climbed 2.2 per in December compared with November as they recovered from a dip following the introduction of new mortgage rules, according to CREA. Annually, the number of homes that changed hands in Canada was up 6.3 per cent last year compared with 2015. The real estate association says the MLS home price index in December was up 14.3 per cent compared with a year ago. Meanwhile, the national average sale price climbed 3.5 per cent in December compared with a year ago. "Home sales are unlikely to benefit the Canadian economy as much in 2017 as they did in 2016," CREA's chief economist Gregory Klump said in a statement. "New regulations mean that in order to qualify for a mortgage, home buyers will either have to save longer for a bigger down payment or purchase a lower priced home. In urban centres where the latter are in short supply, that's likely to translate into fewer sales."